A different presentation of Moses and the Burning Bush. Original post updated 9/2/17. What is going on here? Mary standing in for God? Well not exactly—the infant Jesus represents God in the burning bush. Why Mary? 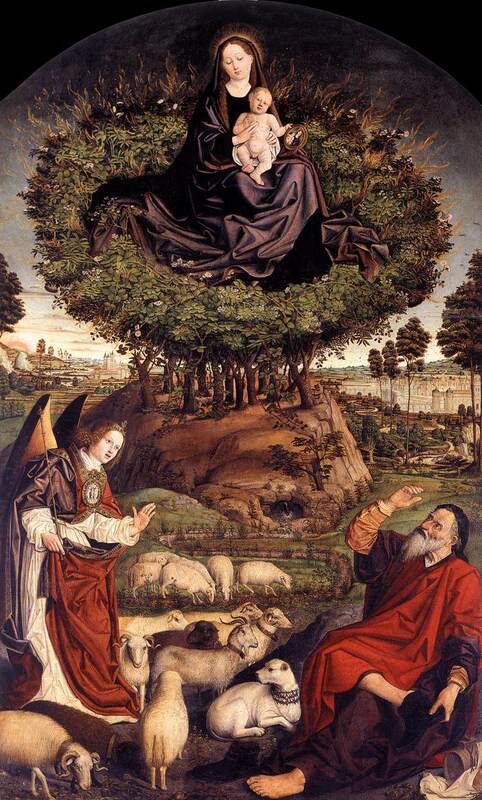 Welcome to typological and allegorical interpretation where Mary represents many ideas and connections. Notice the little mirror held by Jesus. Perhaps Mary, sometimes known as “the reflection of the Church” or “the reflection of faith,” brings our witness to this foundational story of God acting for justice and order in our lives. Previous Previous post: Well. . . what do you think?